Here's the man President Buhari called 'APC presidential candidate' that got people talking. 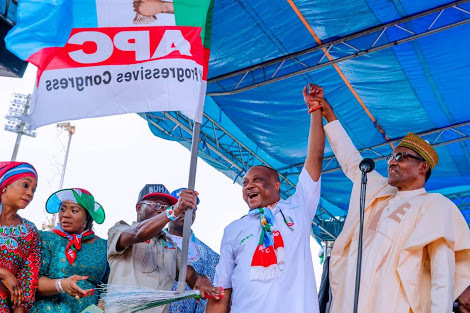 He also referred to the man, APC Delta gubernatorial candidate Great Ogboru, as APC senatorial candidate, he was still wrong. The incident has made many, especially opposition, to ask if Buhari is fit. Buhari was to hand over APC flag to him, then he said: "I am handing over this flag of honour to our presidential candidate." When the man to his left corrected him, saying "gubernatorial", Buhari responded with "to our senatorial candidate".